Penpower Technology has launched Worldictionary – Instant Translation & Search, Version 2.1.0. This iPhone app is a great travel tool. It helps users avoid the hassle of manual typing and the fuss of taking photos. I am really excited to review this Worldictionary app and I’ll give you the reasons for the same. 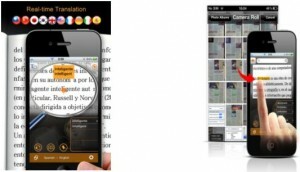 This smart app is an awesome tool for translation. I just have to point my iPhone camera at any unknown word and it gives me the translation instantly in multiple languages. Worldictionary iphone app also allows the search option for manual typing and it saves all the searches in the database for future reference. Worldictionary app almost makes me feel like I have an encyclopedia with me as I travel. +	Worldictionary app recognizes and translates multiple languages like Traditional Chinese, Simplified Chinese, English, Japanese, Korean, French, Germany, Italian, Spanish, Portuguese, Dutch, Swedish, Finnish, Danish, Norwegian, Polish, Hungarian, Russian, Czech, Slovak and Romanian. +	To proceed with looking up additional words or knowing more about the usage of the particular word, we can snap a picture first of the text and then go back to looking them up one by one. +	There is also an option of selecting an image from your iPhone to get the translation immediately, without typing the words in. +	It automatically saves all your search records to recall your previous searches and improve your search efficiency. +	This new updated version provides the translation of two adjacent words. Worldictionary iphone app is a user friendly iPhone app which is of great help to travelers, journalists, editors and people who move around the world. I highly recommend this app to everyone who wishes to learn multiple languages and improve their vocabulary. Click here to download Worldictionary app for $4.99.